JDG runs the official Warrington Town club Twitter on a match day, and also produces match reports and other content for the club’s official website, Warrington Worldwide and the Non-League Paper. Friday November 7th, 2014. A date that will be forever remembered as the day Warrington Town FC firmly put themselves on the footballing map. Craig Robinson’s sixth minute goal was enough to secure a 1-0 win over League Two side Exeter City, a good 100 places above the Yellows in the football pyramid. My first game watching my hometown club some seven or eight years ago was an FA Cup qualifying round match. I remember thinking “what if” Warrington ever made the FA Cup first round proper and Match of the Day. What happened against Exeter was beyond my wildest dreams. I actually missed two games of the run to the FA Cup second round – which took in nine games over seven rounds, two replays and four victories over teams from higher leagues – including the 4-1 Preliminary Round win over Barton Town Old Boys. I literally have no recollection of the 1-0 win over Trafford in the first qualifying round, the first higher league victim in what was a memorable season of cup upsets. The second qualifying round came against Sheffield FC and took two games. The first, at Cantilever Park, ended 0-0 after Scott Metcalfe was sent off in what I remember as one of the most rash red card decisions I’ve ever seen – the referee gave himself no time to think about the decision and had the card out straight away for a tackle that didn’t have a lot in it. The replay followed in Sheffield, the world’s oldest club, on the following Tuesday. I arrived at the ground in absolute darkness, after a failure in the generator had caused the floodlights to go out. For a spell, they weren’t letting anymore people in the ground due to the issues as they weren’t sure if it would be fixed. Eventually they got them back on for a delayed kick-off, and Town won 3-1. I know some people have the third qualifying round down as the defining moment in the cup run, Chris Gahgan’s dramatic injury time equaliser forcing a home replay against Conference North side Colwyn Bay. I missed that one, due to it clashing with the Super League Grand Final. Colwyn Bay were managed by Frank Sinclair, but even he was powerless to stop the Warrington juggernaut. It wasn’t without drama though – on 74 minutes, the two teams were forced off the field thanks to a floodlight failure at Cantilever Park. A similar incident barely 12 months previous had been a pivotal moment in the title-chasing season when the lights failed with Town 2-0 up over eventual champions Curzon Ashton. As it was, the lights made it back on this time and Nathan Burke struck a winner in the final quarter. That put Warrington within 90 minutes of the FA Cup first round proper. Standing in their way was another Conference North side, North Ferriby United – who actually ended up playing at Wembley in the same season, winning the FA Trophy. It was another tight game that was decided by a superb goal by Town right-back Lewis Field, which sparked jubilant scenes at Cantilever Park. North Ferriby had played much of the second half with 10 men after an off the ball incident involving Town striker Steve Foster – who would later in the season be involved in a similar altercation with Craig Robinson after the striker moved on to Radcliffe. A memory that’s etched in my mind is seeing the club’s number one supporter and president of the Supporters Club – Rob Wood – stood outside the changing rooms in tears, such was his elation and almost disbelief at the achievement. All of a sudden, the town sprung in to life. Everyone wanted an FA Cup ticket. The problem was there were barely two weeks to the match and tickets wasn’t something we did! There was a great atmosphere at the club on the Monday night as we awaited the draw, and Exeter were pulled out of the hat. There was a frustrating delay on the date of the game as the club waited to learn if they were to be televised – eventually it was decided Warrington would host the return of the FA Cup to the BBC, against Exeter, on Friday November 7th. 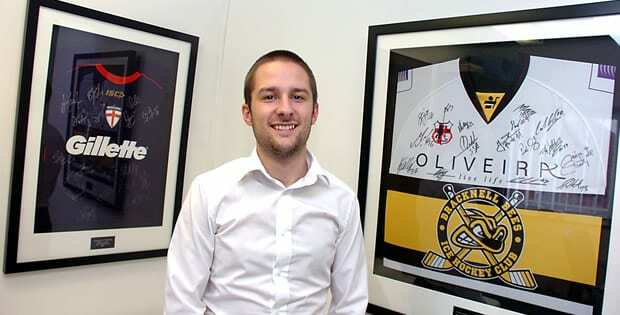 There was so much the club needed to get sorted, and all the people involved behind the scenes did an incredible job, led by tireless chairman Toby Macormac. We needed to get tickets sorted, and they were eventually designed and personally delivered to my house on the Saturday before going on sale on the Monday. I dropped them off to the club chairman ahead of the league game against Droylsden, which was a bit of a damp squib! That was my little contribution to the whole occasion, every little helps! And finally the glorious night came. I got to the ground about two and a half hours before kick-off, having left work in Manchester early. There was a quiet atmosphere at the ground but there were lots of TV people milling about. Our usual place for the game was taken up by the BBC’s make-up department! I was running around trying to do anything I could do to help pre-game. I started in the turnstile for the first half hour or so, letting the first fans in to the ground. Bizarrely, we had someone trying to get in on a forged ticket that he claimed he’d bought off a tout outside the ground. This was Warrington Town! A few familiar faces came through my turnstile, and so then I spent a bit of time doing shuttle runs to the club shop to get scarves for people who wanted them. And then it was making sure the programme sellers had enough change. My dad and sister had come to the game too, and they were stood on the far side. I heard a few loud Exeter fans singing, and it turned out one of them was a lad I went to university with. It was great to catch up with him, although he’s not spoken to me since given the result! The ground really was packed. The immediate build-up to kick-off flew by and I hadn’t actually considered where I’d be watching the match from. In the end, i managed to find my way close to the home dugout, about three deep from the front with my mates. I live tweeted the game for the club, and didn’t put my phone in my pocket all game – mainly because it was that packed, I couldn’t. I’d told anyone who’d listen before the game that the only score Warrington would win would be 1-0, though that didn’t stop my mate putting on Warrington to win 3-1 at 25/1 with William Hill. If only he’d listened. In some ways, I didn’t feel the delirium of the Craig Robinson goal. Partly because I was tweeting, but also because the glass half-empty in me immediately thought that it had happened too early. The performance was brilliant. I felt privileged that I was one of perhaps 200 people in the ground who knew these players, and who watched them in the week. That meant that when everyone else was cheering them on, I felt proud of them. It was great to see them capturing everyone in the 2400 crowd’s imagination. And then of course there was Twitter. The game was live on BBC, and there were tweets coming in from everywhere. Liverpool fans wanting to swap Mario Balotelli for Scott Metcalfe. We were literally the centre of attention in English football for a few hours under the Friday night lights. The BBC couldn’t have wrote a better script. Warrington’s second half defensive display of heroics was incredible. Being so close to the dugout you could feel the tension of Shaun Reid, and at no point until the final whistle were you sure that Town would win. But win they did, and that then prompted the infamous pitch invasion. I didn’t actually see anyone that I knew from attending games regularly until about 20 minutes later, when I saw Gary Skentelbery – Mr Warrington, the man who introduced me to the club several years ago – with his arms aloft looking in my direction. The attention around the club continued, and then came the second round draw on the Monday. I wanted a big League One club away, or another home tie, but we ended up with Gateshead away. A bit unfortunate, as Gateshead are a good footballing team in the Conference and their grounds is an athletics stadium. What that meant was a severe lack of atmosphere for the second round match, held on a Sunday dinner time for live BT Sport coverage, despite the presence of almost 1000 travelling supporters. I went to the game with my dad, fulfilling a lifelong dream of being in an away crowd cheering on my team at a significant fixture. Gateshead got an early goal and scored right at the death, and in truth Warrington never really got close to scoring. It was a shame, but it was still part of an incredible journey. There are probably a number of things that I’ve forgot in the above and that I’ll reflect on in future, but the whole FA Cup run is a memory that will stay with me forever. 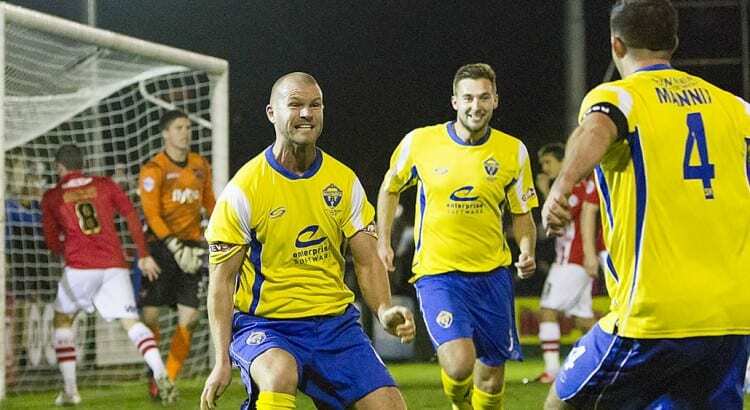 Craig Robinson and manager Shaun Reid will certainly go down in football folklore in Warrington. They will always be the goalscorer and manager for when the FA Cup proper came to Warrington for the first time. Living a dream was every bit as good as I’d imagined, if not better.